The dealer infographic highlights statistics and benefits from a 6 month case study at a USA Honda dealership. The biggest benefits gained were streamlining the payment experience for customers, with a goal to eliminating cashier lines, PCI Compliance, and back office efficiencies. BEFORE: Less than 2% of transactions converted to pin debit. AFTER: Over 82% on average converted. BENEFIT: Reduced risk of disputes; cost savings offset by fee of using CenPOS. CenPOS proprietary technology automatically prompts consumers and employees for exactly the right action that will benefit the merchant most. BEFORE: Did not have tracking to the user level. Controller downloaded banking information and matched to internal hard copy paperwork. AFTER: Controller downloaded banking information and matched to CenPOS reconciliation screen online. No paper printed unless there was an item to investigate. Easy click through any transaction to user level for further review as needed. 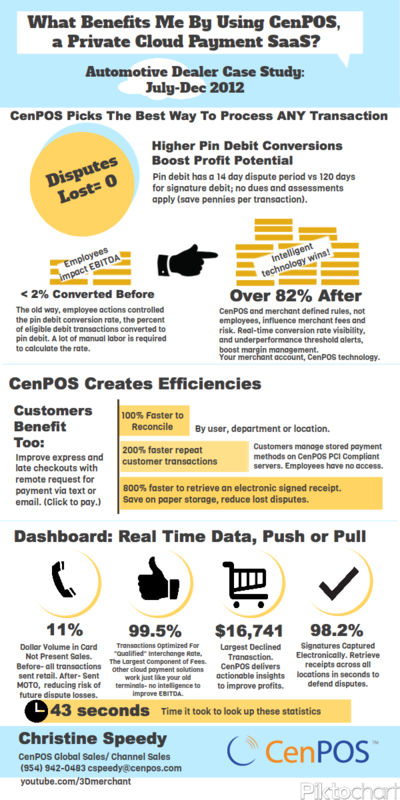 BENEFIT: CenPOS reduces paper waste, printing, and storage. BEFORE: Parts department manager stored card fax authorization forms for commercial accounts to charge their credit card on demand. AFTER: CenPOS securely stores and encrypts payment data. No one has access to the sensitive information. Customers manage the cards to save and update as needed. BENEFIT: Dealer owners face substantial fines, fees, loss of reputation, and even felony charges if exposed card data is stolen, and the dealer cannot prove PCI Compliance*, which is virtually impossible to prove, especially if storing credit card numbers on paper. CenPOS replaced fax forms in notebooks and file drawers containing senstive data, with a form that has only the last 4 digits and the reference token ID, a random alpha-numeric character set. BEFORE: All transactions run on the retail terminals, even if key entered. AFTER: Based on merchant rules, CenPOS automatically identifies the payment entry method and switches the presentment to MOTO (mail/phone/fax order). BENEFIT: If a merchant cannot produce a signed receipt from a key entered transaction on a retail merchant account, there is almost no chance of winning a dispute. Additionally, CenPOS automatically prompts and sends the proper information needed to qualify each key entered transaction for the lowest card not present interchange rate. This is a significant technology difference from other cloud payment solutions. Without CenPOS, a merchant would need two merchant accounts to present transactions properly to reduce risk and interchange fees, the largest portion of credit card processing fees. * PCI DSS- Payment Card Industry Data Security Standards. For more information, please contact Christine Speedy.